Content Runner Idea Engine is Now Live + It’s Free and Super Helpful! The #1 complaint we get from people is that they have a hard time figuring out what to write about. Well, we are proud to announce our new Idea Engine with 2 great API integrations: Grep Words (very similar to the Google Keyword Tool) + Twitter = idea heaven. Best of all, the tool is absolutely free – all you need to do is create a free Content Runner account to get started. Here is what is looks like! If you are looking for organic traffic to your site, a great place to begin is by looking at the popular Google keyword searches. This way you have an idea of the topics that other people are searching for on Google. When you type in your query, say for example: organic gardening tips, the tool will show you the top queries sorted by search volume along with the cost per click data from Google AdWords. We use Twitter as an inbound marketing tool for Content Runner and also as our own personal curated news feed. What better way to get ideas then to type in a query and get the latest tweets that contain that same string of information. The feed is sorted by the last 15 tweets in order of timing, rerun the search if you want more up to date information. Also click on the links in each tweet and read a related article to really get the creative juices flowing. 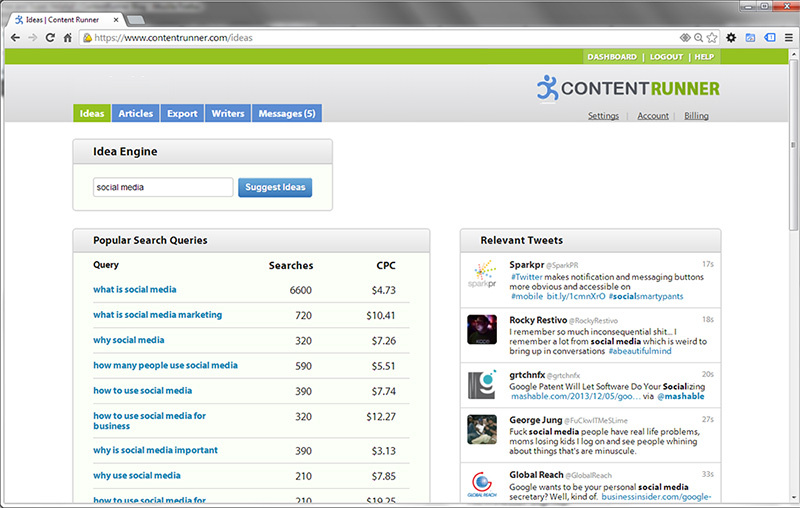 Another outstanding use for the Idea Engine is to find the people on Twitter that are talking about your subject. Send a tweet out to the people talking about your topic and you’ve started your outreach campaign! Go crazy with the tool and brainstorm away for new and innovative topics. Soon enough you will impress your clients with your perspicacity and your content marketing ninja skills.